Today began with the victory of a new meal Gabriel will eat! 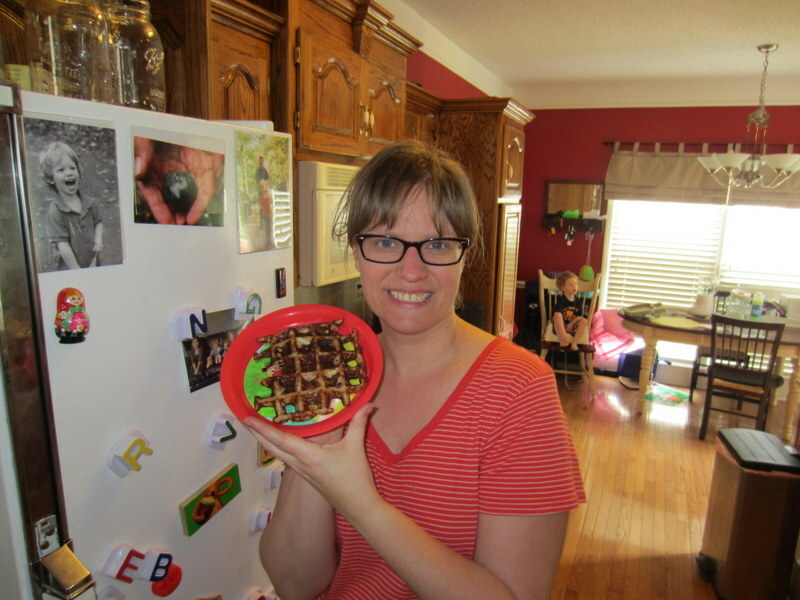 Chuck worked with me last night, as I channeled my inner Rachel Ray, to create a pecan, applesauce waffle for our little guy. The applesauce waffle makes 4 meals that he will eat! So far, we have eggs and cheese, Keto Pizza, Keto Blueberry Pancakes and Pecan, Applesause Waffles. 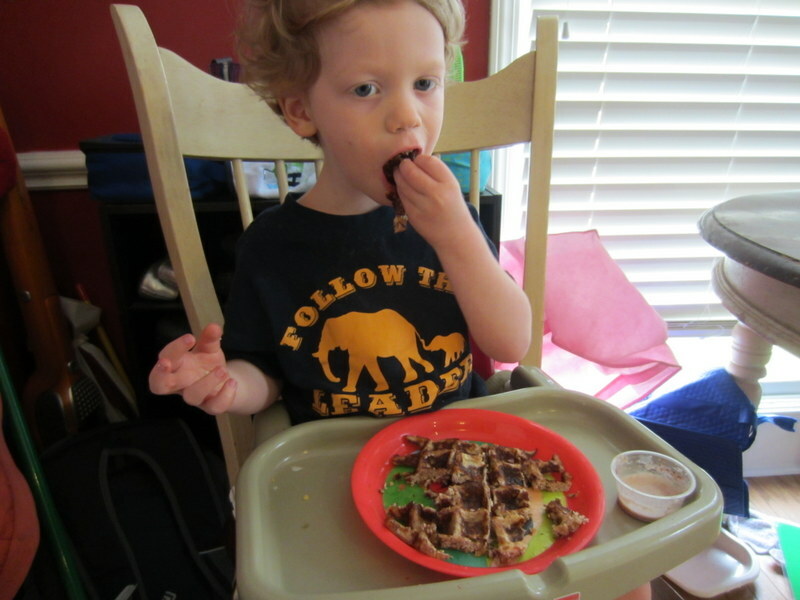 We used applesauce, cream, eggs, pecans and a few other ingredients to make something a little bit sweet and CRUNCHY for him! I can tell he is really missing crunch and specifically toast. He asks me everyday for bread or toast and mac-n-cheese. (We think we may have a solution to the mac-n-cheese arriving from Amazon on Tuesday). Showing off the beautiful creation. It actually looks like a waffle! (Notice him sitting in his chair behind me. He runs and jumps up there every time he thinks he might get food). 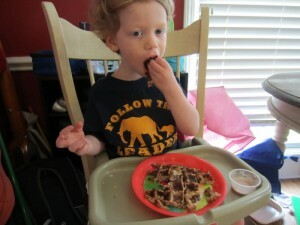 Chowing down the waffle! No time to stop and smile! The cup on the side, is filled win an AMAZING chocolate whipped cream sauce, that he would not touch! We are putting extra cream, in some form, on his tray at every meal. My hope is at some point he will try and like something! The agony of defeat portion of the day came when Gabriel had a 3 minute seizure that began while he was sitting in his chair after dinner. Chuck ran out to the garage for a second to grab something and came back to him seizing. Seconds before he had been chatting with his Grandma Gaye, who was in the next room. That is how fast and without warning they happen. He has had other seizures this week but this was the first time he had one in the afternoon in the quite a while. Sometimes the sets back feel small sometimes really big. Tonight felt like a big one. We are trying to focus on the VICTORIES! I was chatting with a friend on the phone today and she challenged me to write down the victories. No matter how small, write them down and post them somewhere right in our faces. I am totally doing it! Our victories for today are a new meal, and a fun night checking out train displays at the mall. Anyone else struggling with focusing on the defeats? Want to join me in focusing on and celebrating the victories? You are amazing, Amy (& Chuck)! And it’s amazing to think that God really does know what He is doing and that He really does have everything under control. Thanks for saying “yes” to God, “yes” to His ways, and “yes” to loving G the best way you know how. I love you and your passion to leap into the unknown. Melissa, You made me cry! thank you so much for you kind words. This whole thing is terrifying but at the end of the “YES!” “YES!” “YES! Lord!” I will follow you! God you used your wording to speak to me because the song Trading my sorrows (with the YES LORD chorus) has been running through my head today! Ok, can I just say that I LOVE that you are ‘channeling your inner Rachel Ray’! I think that about says it all — because there is resolve to do this diet, to commit your lives to God in prayer, to discipline yourselves to this new way of living, to seek God’s illumination in all that you do, to submit yourself to God’s grace so you might each be transformed in your lives together as a family. Your positive energy is absolutely infectious. You are an incredible mom! Time for me to start focusing on the victories. Love it!